I love people who experiment. 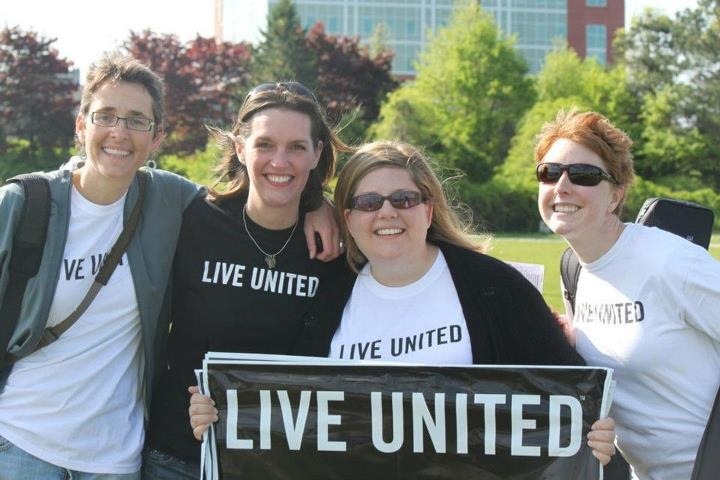 So when United Way of Greater Portland’s Jessica Esch asked me if I wanted to participate in the organization’s 20th Day of Caring by mining stories, I was all for it. Neither of us knew going into it how things would unfold or how we’d use the stories down the road, but that’s okay because we’re the kind of crazy people who roll with it. I showed up at yesterday’s kickoff rally at 7:45 a.m. with my notebook in hand. Jess gave me a few pointers, and then I made my way through the energetic crowd initiating dialogue with random volunteers. I instantly remembered how good it feels to work with a nonprofit and to give people voice – to invite them to contribute not only their services but also their stories. People who participate in the Day of Caring do it out of selflessness. The irony, however, is how much they get back from it – pride, satisfaction, inspiration, joy, and knowledge. Yes, knowledge. The volunteers I spoke with were astounded this year and in years past by learning about the amazing work being done by nonprofits right here in our local community. This includes me. Throughout the morning, I visited Ruth’s Reusable Resources, Mission Possible Teen Center, and The Salvation Army, and I was taken back with each encounter. Talk about perspective. In one morning I learned about ripped binders being turned into sets of magnetic letters for kindergartners, a 17-year-old girl who has no home but an unbreakable spirit, and that 40,000 pounds of food can be sorted and packed in less than three hours through teamwork. I’ll save my stories, but I’ll tell you this: We live in a community where thousands of dedicated people and purpose-driven organizations make miracles happen every single day. And, United Way of Greater Portland helps make it possible. I just spent two whirlwind days in New York City with my colleague and friend Laura Desmarais. We flew down for Fast Company’s 100 Most Creative People in Business event. But before I get into the details of our trip, let me backup and share how it came to be in the first place. So, I am flipping through the May issue of Fast Company, and I see an ad for the 100 Most Creative People Within seconds I tell my husband I plan to go. As always, he supports me. A few days later, I go to sign up and to my dismay, registration isn’t open. What’s a girl to do? Jump on Twitter, of course, and email the brilliant brains behind the magazine’s online content, Noah Robischon. He replies immediately that the site will be ready soon, and he’ll “ping” me. Well, I’m not the most patient person so I keep checking the site, and late one night I discover that registration is open. I also learn that the program is a mere three hours. There’s nothing wrong with this…it’s just a little hard to justify flying from Maine to New York for an afternoon. Deflated, I scratch the conference off my iCal. Until the next day that is when things take an exciting turn. Now I’m literally smiling at my computer. I’m feeling giddy. The writer in me is doing cartwheels. And so the banter begins. I toss out the idea of a tour of Fast Company and drinks with them, and they bite! I jest that they are twisting my arm, virtual high fives ensue, and before I know it I am registered for the conference, making flight arrangements, booking a hotel, and calling Laura to let her know we are New York City bound! Moral of the story: Be open to the unexpected. And, if you want something, ask for it. The world is filled with good people, and more often than not, wonderful journeys unfold.